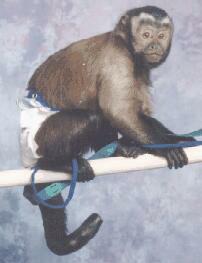 Mookie is a male brown capuchin was born on April 22, 1995 and became a part of our family when he was an infant. His mama was not capable of caring for him so I became his "monkey mama". He was with me constantly, 24 hours a day, for the first 2 years of his life, just the same as if he had been able to be cared for by his birth mom. He came to be a very important part of our family. In the wild infant primates are carried by their moms everywhere (or hang on for dear life). As the babies mature they begin to venture from the security of their mom's body to investigate the rest of their world. When I made the decision to add a monkey to our family I vowed to allow her/him to experience as many natural behaviors as possible. Thus the reason behind Mookie being on me continually, to the point of even sleeping with me. Mookie was going to have to become partly "humanized" and we were to become part of his "troop". family learned about basic primal emotions, all in their purest form. Jealousy, anger, confusion, frustration, joy, even sadness and remorse were exhibited by this amazing creature who had graced our home with his presence. Love, too, was the strongest emotion felt by all who were touched by Mookie, as was with Willow whom was gone from us. The devotion and commitment to care for Mookie was not an easy labor of love, but one welcomed by me. The intricacies of co-habitating with a non-human primate are as involved as that of caring for a child with a moderate to severe disability. The problem with comparing a primate to a child is the primate, ultimately, is a wild animal (it takes centuries to domesticate a species) and as a wild animal they will never fully acclimate to living 100% safely in a human environment. All too often a primate is purchased with the intention of making it a "replacement child". During the juvenile years of a primate's life this can be accommodated but as the primate matures "primal instinct" takes over and what you are left with (if the impressionable years are not cultivated properly) is a neurotic, wild, unmanageable, dangerous animal. The needs and wants of the primate must be first and foremost, to accommodate them. It is definitely NOT a decision to take lightly and once taken, will continue for 30 - 45 years in most cases. Atrocities occur and it is mandatory that people be held accountable for their actions. 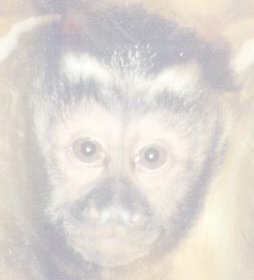 Wednesday, July 2, 1997, I was in a local grocery store with my capuchin monkey, Mookie, shopping, as I have done for the past 2 years with him. While I patiently waited in the check-out line between two local woman, he was visiting a man (while still attached to the leash and myself as he is always ) accompanying several children (I am not sure if they were from a camp or where). I spoke to all of them and answered their questions pertaining to the work Mookie does. He became a part of our family at several weeks of age and turned 2 years old in April. I had been granted a permit from our State Dept. of Inland Fisheries and Wildlife for him to be allowed into the state of Maine specifically to participate in therapeutic type endeavors. I had done research for over 2 years prior to acquiring Mookie, before coming to a decision that I would be competent in the undertaking I was about to embark on. In May 1995, I began a journey that ended in devastation not only for Mookie, and myself, but for many many others as well. That fateful day as he leapt back to me, he quickly decided, as only a monkey seems to be able to do, unfortunately, to try to leap to the back of the woman ahead of us in the line. I grabbed him in midair but not in time to prevent him from grabbing at her hair and succeeding. I disentangled his fingers and he had not pulled a strand of her hair out. I scolded him for his actions and apologized to the woman for his behavior. She ignored me. I paid for my groceries and left the store. The following day two state game wardens arrived at my house to talk to me about "The Bite". I asked them in completely perplexed...What bite? I had no idea what they were referring to. They repeated, "The Bite. The bite yesterday". And again I asked them what they were talking about. They proceeded to inform me there had been a complaint issued by the woman in the grocery store, that Mookie had scratched and bitten her. I was in total disbelief and replied that Mookie had grabbed her hair and might possibly have accidentally scratched her but, there was no way he bit her! They then brought up an issue pertaining to the required permit necessary to keep Mookie in compliance with their regulations. I informed them I had sent in my paperwork, after calling the person in charge of licensing and permits to inquire what they expected in the way of documentation. I sent in my report in March 1997 and never received a denial of the renewal application. I, unfortunately, had not noticed that I was never sent a paper of approval either. I had sent a similar report the preceding year and my permit was renewed with no problem , the only difference this year was that I had increased the amount of time spent doing the therapeutic work. (Each year as Mookie grew older I had planned to increase the work we would do together in this area. I would like to add here a partial list of the things I do so as to clarify why that paper could have gone unnoticed. I have been a therapeutic foster care parent for the state of Maine Youth Center (I care for teen boys that have been in jail) for the past 4 years (the previous 11 years doing regular foster care parenting), I have been a licensed wildlife rehabilitator (state, and federal) for about 19 years, I have been a Sunday School teacher for our local Methodist Church for about 17 years, a volunteer staff for our local teen center for 3 years, the biological mom of a 17 and 11 yr. old boys, a horse rancher for the past 28 years and during a majority of that time it has been as a single parent. I have also in the past been instrumental in developing a therapeutic riding program with the Paso Fino horses I raise. I was Executive Director, riding instructor, and performed many various duties as Public Relations, fund raising, caretaker for the horses and educator for this program that grew to serve up to 25 clients riding weekly. I would also like to add that the only monetary gain I received was the stipend paid to me for the foster care I did. All the other aforementioned activities were purely donations of my time as a volunteer, doing things I enjoyed. local police call after midnight inquiring, could I take in two homeless teen boys that had been found sleeping in the local Laundromat? and my reply as always was, "Yes". I have walked downstairs in the morning to find a woman sleeping on my couch, who knew she could find safety here from an abusive husband. People are constantly bringing animals for me to aid to the best of my ability and those that were beyond my expertise, I would bring to our local veterinarian hospital which donated its medical expertise. Is it a wonder I hadn't noticed my renewal had not been sent? I asked the name of the woman who claimed to have been bitten and I was told to call the chief of police. I was also to produce documentation as to the medical records on the monkey and get those to the police as well. I was in total bewilderment as to the situation and continued to try to question what exactly was going on. The warden told me Mookie was not supposed to be out in the public without being in a carrier, if at all. I replied to him that I wanted to know why none of the wardens, including him, had informed me of that when I would see them in town, at the town offices, and also why they had not spoken up then in relation to my permit situation. Warden **** ****** insisted he had never seen me in town, which is not true. I was not getting any answers and subsequently called Chief **** of our local police force. He would not give me the name of the woman who had accused Mookie of biting her and told me he "was pushing the case". I informed him Mookie was up to date on all medical needs and the records would be sent to him directly by the veterinary hospital. phone bills to find their number on my bill. The next thing I see in the local newspaper coverage is a statement that Helping Hands had never heard of me. I proceeded to call the woman who had been behind me in the grocery store line to ask her the name of the woman ahead of us and she was not able to remember her name either. I asked her about the incident and she did not feel that Mookie had bitten the woman either. accepted the conditions with no disagreement and proceeded to comb through my immense amount of documentation I had accumulated over the past 5 years. I gathered up papers one by one to be brought to a local office store by a friend be copied and given to the Fish & Wildlife. I was not given a time frame and worked diligently at amassing the necessary documentation. During all of this, I was still wondering, "What the hell was going on?" On Friday, a friend called and told me the name of the woman was, (***** *********, the wife of *** *********, who owned ********* Motors in town). My friend also informed me that the only problem these people were having with the situation was that I had not apologized and all they wanted was for me to pay the doctor bill and for a tetanus shot. I called the dealership to try to reach the people and left a message with an employee asking they call me. I also sent a card apologizing for the incident, not the alleged bite. At that point I felt I was making headway of all this situation. Several days passed and the next thing I knew....... it was Monday afternoon, July 7,1997 and I glanced out my window to see two game wardens, a police car and a truck drive swiftly into my dooryard, all at once. Everyone stepped out of their vehicles and proceeded up to my home. I was informed Mookie was being confiscated due to the fact I did not have a valid permit in my possession. I looked at them in disbelief. My mind was racing, thinking what was going on and what could be done. We proceeded to negotiate for about 2-3 hours. The wardens insisting I give Mookie up to them, which in turn he would be given to (****** *******) of the **** Zoo. ****** was the person they used as a drop off point for confiscated animals. He also is on their Board of Directors, which determines who is and is not granted permission to obtain an exotic animal. I might add here that I was informed that Maine does not give out permission for pet monkeys, yet Mr. ******* was in possession of several capuchin monkeys. granted a class C - exhibition permit, that ****** had told him his monkeys were pets. I had inquired because the conditions I had seen his monkeys on the day I had visited his establishment the previous year, were not up to the standards required by the USDA, as far as I could see. ****** had been given a zoo permit for his menagerie but the monkeys were not included, stated the agent, due to their pet status. I have since been curious as to the disposition of the other monkeys and other animals brought to ****** by the Fish & Wildlife. I personally believe there is a conflict of interest in this man's positions with the state. Due to the conditions I had seen at the **** Zoo I decided to do anything in my power to prevent Mookie from being brought there. I would have gone so far as to have him euthanized rather than be subjected to having to go there. I made several phone calls as the negotiations continued. Finally I was able to reach a local lawyer and he was successful in negotiating an agreeable compromise. Mookie would go to the Bridgton Veterinary Clinic for a quarantine period, while the issue was addressed further. I loaded him into a carrier and had to practically beg to be allowed to ride with him in the vehicle transporting him to the vets. Upon arrival, the quarantine room was readied and I took Mookie to it. One of the most difficult things I have ever had to do in my life was to place him in that cage and lock the door. I had no way of explaining to him why I was, in his eyes, abandoning him, and as I walked away he screamed for me. You must remember for practically the entire 2 years of his life he had been in my company. He went everywhere I did. To town to the stores, church, the teen center, and the list goes on and on. He slept with me and showered with me, sitting on a homemade shelf washing himself as I washed myself. He and I were so closely bonded that this was devastating to both of us for him to be left in that cage. I returned the following morning to visit him. I had been reluctantly given permission to visit him but was not allowed to take him out of the cage to hold him. When I entered the room, expecting to hear a welcoming greeting, I was ignored. Mookie turned his back on me and would not speak to me with any of his normal greeting sounds. I was absolutely crushed that this emotional destructiveness was happening. I stayed for over an hour and not until it was time for me to leave would he interact with me, and then barely at all. As I rose to leave he grabbed for my hair, pulling me to him, as if to plead with me to take him with me, and I had to turn away and again leave him there. I cannot begin to describe the agony I was going through. I felt he too was going through the very same distress. I began my attempt to resolve this issue satisfactorily by driving to my lawyers with many papers I had gathered to present my case to regain possession of Mookie. I made numerous phone calls. My lawyer made calls. The only thing I was ended up being guaranteed of, was that the Fish & Wildlife would NEVER issue me a permit to have Mookie again in the state of Maine. They began citing me with the requirements they insisted I had not met. Mookie was not being kept in a carrier when out in public. I had not complied with them about my association with the Helping Hands program. Mookie was not allowed out in the public under any circumstances. And last but far from least, I did not have in my possession a current permit. I was given a summons for the lack of a permit. The entire situation became worse and worse and I began to worry more and more that Mookie at some point would be handed over to ****** *******. He could not stay at the vet's forever. I proceeded to find an alternative for his placement, realizing I was not going to be given access to him in the state of Maine, at least not in the near future. After many phone calls and pulling of strings, Mookie was granted permission to leave the state of Maine to go to a wonderful sanctuary in Florida, The Wise Monkeys. It was a place I had made arrangements with, for Mookie to go to, if I should die before him. The facility is entirely privately funded by the owners and is very clean and the primates housed there are cared for with the utmost responsibility. I made arrangements for Mookie to be driven down there and he left Wednesday, the 9th to head to Florida. The minute Mookie had crossed the border out of Maine and was safely out of harms way of being placed at the **** Zoo, I prepared to do battle with the people involved with this situation. I was going to get answers and I wanted complete explanations of how this situation could have gotten to this point. While I continued to search my papers for documentation to back up my position, others had apparently been busy as well. People had heard what had happened and were calling and stopping in to ask what they could do to help. I asked that they pray for Mookie's safety first and foremost. The next thing I knew newspaper reporters, TV and radio stations were calling me to ask what happened. The teens in town had been spreading the word about my situation. I found myself answering many questions over and over. I had decided that if Mookie would never be allowed to be with me and do the therapeutic work we did in the communities that I would pack up and leave the state of Maine to do our work elsewhere. When that news spread, I had teens calling me on the phone crying, adults (women and men) crying at the idea of the loss, our leaving would bring. I was overwhelmed by the amount of support pouring out of my community. I finally came to the conclusion that perhaps there was a chance at a resolution to this disaster. I began to inquire about the governor of our state giving Mookie a pardon and allowing him to be returned to me so we could continue our therapeutic work. sent them) , documents stating animals in a therapeutic line of work or even training being allowed in public places, and last but not least the permit itself stating the few guidelines I was expected to follow, which I had followed. I also was informed, second hand, by New Hampshire Dept. of Fish & Wildlife that I should have been completely within my rights to have assumed my permit was valid as I had never received a denial of my permit from the Maine Dept. of Fish & Wildlife, when asked by the press about this situation they were given no comment. The entire situation is filled with inconsistencies and should never have happened in the first place. This is not even the complete account there is more to it but this is a fair amount of information for one to access as to the situation. One hundred and thirty three days have passed since Mookie arrived at The Wise Sanctuary, in July of 1997. It is now November 21, 1997 and Mookie is finally home with me in Maine again. The following is my account of the days between his departure and final arrival to be reunited with me. This is a depressing presentation and one of the most debilitating situations I have ever had to deal with in my entire life. moving out of the very state I had given much of my adult life to, if I was to be reunited with Mookie again. Over and over again in my mind ran the thoughts, why me?? what had I done to deserve this?? what could I do and where could I turn for help?? As I felt I had just about reached my breaking point, I remembered the power of prayer, and I began praying. I prayed for Mookie to be safe, I prayed for strength for me and most of all I prayed for the salvation of the people who had been responsible for this terrible occurrence to escalate into such a disastrous mess. When people called and asked what they could do to help..... all I could answer them with was, "pray" for the for mentioned things, and pray long and hard. It was the only constructive thing that could be done at that point. The newspapers had not been kind in their assessment of this encounter, saying basically, a "Pet Monkey" had been confiscated from local woman. I called and asked that the label "pet" be replaced by the proper term "therapy monkey" and the request was outright refused. The article was posted in local papers as well as seen in The Boston Globe and a Florida newspaper (to my knowledge, I don't know if it was published anywhere else). I sent my account of the occurrence to many newspapers, none of which ever published my side of the story. A radio talk show interviewed me and television stations came to my home to interview me as well. Yet still I found no governmental official willing to intervene in my behalf. I was becoming very disillusioned with the entire state of Maine. I received a call a few weeks after Mookie's departure, informing me of a lawyer who had expressed interest in my situation. A divorce lawyer from South Portland, had read a news article about my plight and offered to represent me for free, as he had all animals' best interests at heart. The first question he asked of me when I went to his office to confer about my problem was, "Is Mookie all right?" This led me to believe I had finally found someone who truly wanted to help me and was in a position to be able to help as well. I showed him all my paperwork and explained the story from my point of view. When I had finished, he agreed to do all within his power to help me resolve this, gratis. I returned home with a lighter heart, never once imaging the battle had just barely begun. After reviewing my information, Mr. ********* suggested I reapply (again) for a renewal permit for Mookie. I did this, expecting a reply within a month. The month passed and no answer. I was given permission to call Fish and Wildlife, by my lawyer, to ask for a decision and was told by the Dept. (Major ***********) they would not make a decision until the court case was decided. More sitting and waiting, wondering, and worrying. When was this all going to be over and done with? Each day felt like a year. I found myself unable to go to town as the few times I attempted to go into a place I had gone previously with Mookie, the tears would start streaming down my face. It was a combination of the feeling of my loss of a part of me as well as the feeling of total helplessness over a very unfair and seemingly unethical procedure being forced upon me. I finally resigned myself to the fact that going to town was not something I was willing to subject myself to, and during the one hundred thirty five days Mookie was gone, I went to places in town less than a half dozen times. I could not even bring myself to go to my church as I felt I would fall totally apart there and have to be carried out in a "basket". These feelings overwhelmed me and I had absolutely no control over my thoughts and emotions. I had never in my life, in all my years of dealing with the strife that I had faced, felt so debilitated and helpless. I had always considered myself a survivor and I was just barely able to function on an everyday basis as time went by and no resolution seemed to come into sight. I pushed myself to shop for a few food necessities far away from the town I had put my heart and soul into. I stayed home and worked diligently at my computer and on the phone searching for answers and help for my cause. I could not sleep in my bed which Mookie had shared with me, as I lay awake all night long with questions racing through my mind. I occasionally slept on the floor of my living room, and but of the time, I slept on the floor of the deck outside my bedroom. I began sleeping only between 2-4 hours a night, staying up researching and typing on my computer until I would fall asleep from sheer exhaustion. This continued during the entire time Mookie was gone from my home. everywhere. I tried to keep focused on praying, yet was not always successful. I had met many wonderful people on the Internet, in a Native American chatroom I visited, when I wanted a distraction from my present desperate world. I had asked every person I met to pray, for Mookie, for me and most importantly for the people responsible for this tragedy. I knew people all over the world were praying and it still, sometimes, was not enough to prevent me from sinking deep into myself and the never ending mental pain I endured. Time went on, yet felt as if it stood still. Every day felt like a year. Time grew close for a court date and I felt hope that a resolution was close at hand. Then my lawyer suggested we request a jury trial rather than going before a judge, for a more fair outcome. I agreed, not realizing that meant another month or so of waiting. Upon that realization, I went into a nose-dive straight to mental hell. I felt sheer desperation - this matter was never going to be resolved and time was growing short for me to be able to successfully move to a more accommodating state (meaning more lenient about permits for primates), in regards to primate private caretaking ownership. was doing. I now have very little recollection of the past four and a half months of my life, July until November and don't believe I ever will, with the exception of a few occurrences. I had been seeing an acupuncturist for close to a year and I did continue to see her bi-monthly. She had been instrumental in treating me for several things successfully in the past and was compassionate enough to allow me to barter with her to continue to see her during my saga. (Fresh milk from my cow, home-made butter and farm fresh eggs became my payments to her) She is one of the few true healers of our present day life I have been graced to know. Finally, a suggestion was made to contact a government official. I started with Olympia Snowe's office and was directed to **** ******, my local senator from Norway. I called him and related my entire story to him. He listened attentively and asked several questions and then told me he would do all he could to help me at least get some answers from Fish and Wildlife. Mr. ****** spent several weeks trying to get information about my situation, but to no avail. I had spoken several times to him on the phone and he finally called three weeks after our initial contact to say he was getting nowhere with Fish and Wildlife and the only recourse he saw me having was to go to court to get this all resolved. He had done his very best and all I had was more waiting. I was very appreciative of all his efforts but was despondent with all the obstacles being thrown in my path. I do recall during this period of time, coming up with some very "imaginative" potential solutions to my dilemma. It occurred to me that if I got myself ordained as a youth minister by mail, I could specify my home as a sanctuary and perhaps keep Mookie here, safely away from the hands of our government because of religious shelter. Another idea that ran through my head was to find a psychiatrist who was open to unconventional therapy. I don't take conventional medicines but I decided Mookie could be prescribed to me as my therapeutic animal to combat my depression. I was grasping at any straw possible to be reunited with Mookie. I felt as if I had been emotionally raped by the people responsible for all of my pain. My life had been totally changed with one false accusation leading to an abundance of unethical actions following it. I began being very discourteous to people I saw as "the enemy" and became even more withdrawn from real life society. I found solace in chatting with the friends I had made on the Internet. I had people praying all over the world for my situation, South Africa, Europe, Asia, South America, and across the United States, people all were holding me up in prayer, supporting me in the only way they were able. People who had never ever prayed in their life were now praying for a positive outcome for me. I knew in my heart many people loved me but it still was not enough. Weeks went by, and mentally I got worse and worse. So bad, in fact, that a dear friend came over, bringing a close friend of hers and between them, ******* and what was left of me, we prayed. Long and hard, we prayed for the demons trying to overtake my head to be gone and leave me in peace. Through the power of prayer and faith, the demons were removed and my head felt lighter and clearer and more at peace than it had felt in a long long time. From that point onward I was able to start my climb back out of that mental hell I had sunk into. I began to fight with all my heart and soul to not succumb to the powers of evil. It was at that moment the sift began to occur. My court date, October 31, 1997, was approaching fast and in the days right before it was to take place, I contacted many strong positive people. My previous pastor, shamans, everyone who had chosen to become involved in my plight. The day of court, as I traveled to the courthouse, I felt totally at peace. The night before I also had slept better than in all the preceding months since this episode began. I greeted my lawyer, we entered the courtroom and much to my delight, I was informed that the case in regards to Mookie had been dismissed. I hugged my lawyer and gave thanks to God for this blessing. I was told to wait until the following week before calling Fish and Wildlife for a decision on my renewal permit, now that court was over. I contacted everyone I knew to let them know the joyous news and we celebrated in spirit all over the world that night. On Thursday, November 6, 1997, I drove to my lawyers to meet with him and make the anticipated call from his office. I eagerly dialed the number and much to my great disappointment was told "no decision had yet been made, call again next week." Despondently, I left the office and drove home, tears streaming down my cheeks again. Will this never end, I thought, and again visions ran through my mind. I mentally pictured a scene I will not repeat here. I knew I just needed to get home and then I would be safe and strong enough to push aside those horrible mental pictures racing through my mind. Thank God, as soon as I was home and had gotten in my house, I was able to rid myself of the dark forces pervading my mind and soul. I called ******* with sobbing tears and dumped all my agony on her. She was finally able to give me the energy to go on and wait yet more days for an answer. The general opinion was that Fish and Wildlife had come to the realization they had treated me very unethically and were now trying to save face in any way possible, again at my mental expense. Each hour seemed like a day and each day seemed like a year. On November 10, 1997, I began calling daily, asking for an answer and was given excuses such as, they hadn't received the court papers, they had been "told" my case was not dismissed, anything possible to stall giving me a decision. Again, I fought to stay calm and in control of my emotions outwardly, while within I was dying a little more with each postponing answer. Finally, on November 13, 1997, I called again, seemingly for the hundredth time of rejection, and received the news I had waited an eternity to hear. **** *****, of the Warden Service, very plainly and matter-of-factly stated to me, my permit had been approved. I very politely asked that it be notarized before sending it to me, as requested by The Wise Monkey Sanctuary, and after a bit of negotiations, I was told it would be done and sent out the next day, Friday Nov. 14, 1997. I was also assured a copy would be faxed to The Wise Monkey Sanctuary that very day. I immediately contacted Tim and Minnie to let them know my battle was finally over, or so I thought. Again, nothing in this entire scenario was going to be made easy for me. I had met a pilot on line who was looking into a free plane ride to and from Florida for me. I had well wishers all still praying for this to be entirely over and Mookie back home here where he belonged and still nothing wanted to go right. Friday came and went, uneventfully. Saturday, I anxiously awaited the mail for my permit to arrive. I had been calling airlines to see about connections, as the free ride was not to be. I also contacted The Wise's to ascertain their schedules for my arrival to pick Mookie up to bring him home. The mailman came and, NO permit. I immediately called the Post Office and asked them to hold my mail on Monday so as to get my permit then. At this point I had made reservations to fly to Florida on Tuesday, November 18, 1997 and to return home on Friday, November 21, 1997, with Mookie. I drove to the Post Office on Monday morning and to my dismay, again NO permit. I was trying to control myself and avoid becoming frantic. I returned home, again called Fish and Wildlife and was told by **** ***** , the permit had not even been mailed out yet. I very nicely asked her to fax me a copy of it, as my travel arrangements had already been made. She hesitated until I insisted a bit firmer and finally was sent the long awaited paper, with my written permission to posses Mookie legally in the State of Maine. A copy was also finally sent to The Wise Monkeys as well, as it had never been sent the day it was promised to be sent. been placed in my home since then.) I was going to borrow money from anyone I could when friends offered to pay my entire way! A couple who prefers to remain anonymous paid for my round trip ticket in full and all I had to do was to drive to the travel agent to pick them up. carrier I had brought in the back seat of her van. We hugged and introduced ourselves to each other and I heaved a sigh of relief. I was there and all in one piece! We chatted about numerous things as we traveled to their facility, one of which being the possibility of Mookie holding a grudge against me for abandoning him so many days before. I had known there was a very good chance of him rejecting me and the very thought of it had brought tears to my eyes each time our reunion scenario ran through my mind. I had been imagining this moment for more than four months and it was still like a dream that I was finally there. We stopped at the local market that donated its excess produce to the sanctuary on the way home. I tried to remain calm and not burst with excitement as we neared their place. Finally we had arrived. I got out and looked at Minnie and she began to lead me around their home towards the cage Mookie was housed in with another Weeper capuchin, Milo, a four year old altered female. I was very impressed with all that I saw in the way of caging and all the animal's demeanors as I walked out through cages upon cages of primates. Even before he could see me, he heard my voice and began to call to me, as my tears ran down my face. The time had come, would he embrace me or reject me. As I reached his cage, his call increased in volume and he reached his tiny hands out the wire to embrace me!!! My heart and soul sang with joy as the tears, now tears of happiness, streamed down my cheeks. I took his hands in mine and put my face to his and began to tell him how much I had missed him. We chattered back and forth to each other for a while, then I went to the house to put my things away. He called to me and I assured him I was not leaving him, just getting settled in. I put my bags away and helped unload the van, and then had the pleasure of helping feed the primates at the sanctuary, all 60 of them! Each of the primates at the sanctuary came there with a story, Minnie relating each tale to me as we made the rounds at feeding time. Tim Wise arrived home as we were finishing chores and I had the pleasure of meeting the man I had shared thoughts with for many months on the Internet and on the phone. He was exactly how I had envisioned him to be. We greeted each other with a hearty hug and went on about our business. When chores were completed, I was allowed to take Mookie out of his cage and allow myself the liberty of the moment I had been waiting for all these months. I put on his waist leash and held him in my arms as he hugged me for all he was worth, all the while chattering about his experiences. I felt as if I had died and gone to Heaven to hold him in my arms again. Time stood still and I finally was at peace. Mookie and I enjoyed each others company for several hours and then Minnie asked if I minded terribly if Mookie spent his last two nights in the cage with Milo, his cage companion for the past several months, so she would not be so lonely. I agreed and put him back for the evening with Milo. He called to me but not overly urgently. I tried to reassure him I was not going to leave him and he seemed to settle down. In the house I was allowed to interact with Minnie's female spider monkey, Budie, who was four and a half years of age. We cuddled and groomed each other and I enjoyed every second of it. Then she was put to bed for the night. The next day, I again helped with morning feeding chores , produce for all of the primates. Then I was treated to a trip to The ***** ****. Well, treat may not be the best way to describe the facility itself. All the positive qualities I saw at The Wise Monkeys was severely lacking here at The ***** ****. The conditions were out of your worst nightmare. Chimps were housed in cages not even tall enough for the chimps to stand their full height. Most were singly housed in areas no bigger than a small jail cell. My heart ached for them. Many showed extreme signs of neurosis and even those caged in pairs were lethargic and depressing to view. One emaciated female chimp was lying on her side, the story behind her lethargy was a treatable intestinal blockage. The pity being the owners would not allow her to be operated on to alleviate the problem, so she just lay there waiting to die her slow death. Another sad story behind one of the caged chimps was an entertainment retiree. This male chimp had played the part of Cheetah in the old Tarzan movies and due to his treatment during that time, he now hated all people. I was informed he tried to hurt and/or kill any human getting within his reach, thereby resigning himself to total seclusion, devoid of any social interactions with another living creature. And the horror stories went on and on. proceeded to hug and kiss me. We then played jump and tickle for about fifteen minutes and I thoroughly enjoyed every second of it. It was my first encounter with a real chimpanzee and I was amazed at the dense mass of her fifty lb. body and the strength she had at the young age of three. I now understood more fully why I had been told in the past how strong and dangerous they can become as adults. One feel of the grip she had at her age was enough to last me a lifetime. The owner had to go and I parted ways with ****, the memory forever etched in my mind. Minnie and I returned home, cleaned cages and then took Mookie to the veterinarians for his health check - up for the trip home, as mandated by law. He passed with flying colors and we proceeded home to again feed up all the primates, their afternoon meal of monkey chow. By now the monkeys had become more used to my presence and were not as leery of me helping Minnie. I was pleased they had accepted me so quickly. I was formally introduced to Coby, their eight year old male chimp and his female companion, Tina, who was eleven. Coby blew me kisses and performed several other maneuvers he had learned. Coby had been trained in using some sign language and he was showing me what he knew. The intelligence of this beautiful creature was overwhelming. I watched him as he ate, using utensils, and displayed compassion towards his companion, Tina, by sharing his food and toys. Minnie explained to me the subtleties of his actions and what each expression and motion signified in his world. It truly was an honor to be introduced to this magnificent primate. By the second day I had settled into the caretaking routine for the primates and was overjoyed to participate without immediate supervision. I helped feed twice daily and clean by hosing and raking each of the housing units for the occupants. The smallest being a pair of Red-Handed Tamarins, others included a pair of Ring-Tailed Lemurs, several Squirrel monkeys (Common and Bolivian), numerous Capuchins (Weepers, Black & Whites and Cinnamons), Spider monkeys (various sub-species), a pair of Patas (the fastest primates in the world), a beautiful pair of Gibbons, the pair of Chimpanzees, and last but far from least a Vervet, Todd, whom had lived with Minnie all of his twenty one years. He remained outside all day in his area and came in each night to his own special cage in the house. He was a sweet tempered altered male who loved to be groomed and I accommodated him every chance I got. Before I knew it, Friday morning had arrived and it was time to return to my home. I made a final round to say good-bye to all the animals and have one last look at all of these wondrous creatures I had come to love so quickly. I said my good-byes to Tim and the children, then Minnie and I loaded my bags and Mookie in his travel cage into the van and we left for the airport. I did my best to hold back the tears as I said my good-byes to Minnie. Her and her family had been incredibly kind and giving to me and it was hard to leave. They had done more than words could ever express in caring for Mookie as well as taking me in the days I stayed with them. The children were wonderful, very well mannered and, personable. Tim was above reproach, he undoubtedly cared tremendously for his family and the primates in his care. The entire family was a shining example of how life should be. I left with a warm heart and caring thoughts. Should you be considering adding a primate to your family situation, PLEASE, educate yourself fully. Find a place to devote volunteer time to gain the necessary experience needed to care for one properly. Consider adopting a "throw-away" adult primate who has been displaced for whatever reason. I want to state here that we have added a second primate to our family. 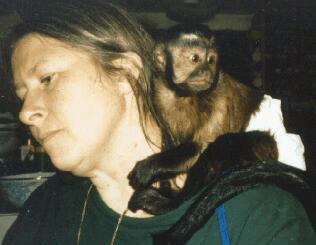 Milo, an altered female brown capuchin joined our family the spring of 1998. She was a "displaced" adult who was graciously donated to us through the combined efforts of her original owner and a wonderful sanctuary called "The Wise Monkeys", located in New Port Richey, Florida. The language, both vocal and body, varies even between sub-species and a human family can only fill a part of the void left when a primate is secluded from their own kind.